The Space Launch System (SLS) Mobile Launcher (ML) has completed its debut trip to Pad 39B, following a steady journey atop of the Crawler Transporter (CT). While a large amount of testing will be carried out at the pad, the trip down the crawlerway provides engineers with vital data, which can be feed into the Concept Of Operations (Con Ops) for the Heavy Lift Launch Vehicle (HLV). Built by Hensel Phelps of Orlando, Florida, the ML was designed to specifically support Ares I – prior to the vehicle’s demise as part of the Constellation Program’s cancellation. The ML consists of the main support structure that comprises the base, tower and facility ground support systems, which include power, communications, conditioned air, water for cooling, wash-down, and was designed with ignition over-pressure protection in mind. 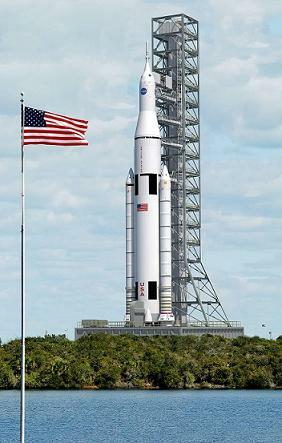 Work will be required on modifying the structure – such as the launch mount – for the SLS configuration, although this work won’t take place until next year at the earliest. The trip to 39B was taken at a very steady pace, allowing for critical measurements to be taken during the 4.2 mile journey. The ML’s only previous ride on the CT was a short transit from its construction site to the parksite near the Vehicle Assembly Building (VAB) for power and utility connection testing. 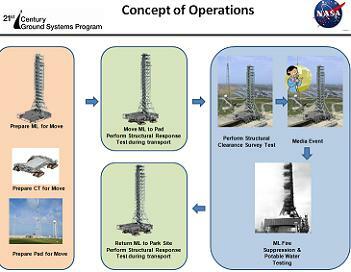 After being parked up at that location for over a year, plans to move the ML to 39B were shown in an expansive presentation – acquired by L2 – which included details on the test objectives to be conducted on the giant structure once at the pad complex. Four key tests will be involved, relating to the structural response of the ML during rollout, structural clearance, HVAC (Air Conditioning) pressurization, and Tower Fire Suppression testing. The ML will be powered up via the pad’s power supplies. In total, the ML can look forward to about a month’s worth of activities, with one of the highlights being the Fire Suppression deluge test, which will see the structure and tower – as depicted in the presentation – mirroring the Apollo ML water deluge test in March, 1966. The Atlas V launch with the Mars Science Laboratory (MSL) – scheduled to take place on November 25 from next door’s Cape Canaveral – will be also take place during the ML’s stay out at Pad 39B. Numerous media opportunities will also take place, as the Kennedy Space Center (KSC) shows off one of the key elements of their 21st Century Space Launch Complex future. It will then be transported back to the parksite via the same Crawler Transporter, where it will receive a new coating of paint – required to protect the structure from the space coast’s corrosive salty air – due to begin in mid-December. The ML’s key roll in SLS’ pre-launch operations were presented in great detail via the final version of the SLS Concept Of Operations (Con Ops) presentation, a highly expansive “bible” of SLS operations, from operations to reference missions. Several months in the planning, and refined via numerous meetings, the late October presentation – acquired by L2 – includes basic and technical overviews of all elements of SLS Con Ops. 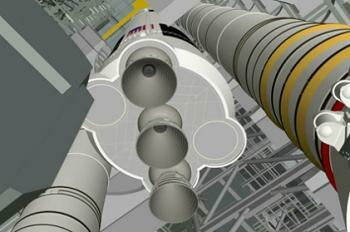 “The SLS will be integrated on a ML, which includes a base and umbilical/access tower. 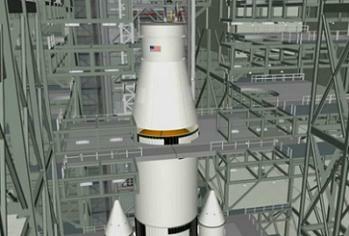 The SLS is planned to be assembled and integrated vertically. 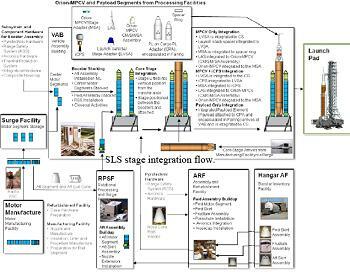 Once SLS stages and payload(s)/Orion-MPCV are integrated, ground interfaces are established and a series of integrated tests will be performed to verify all flight systems prior to rollout to the pad,” opened the basic overview in the presentation. “Once testing is complete, closeout and pyro activities are performed. The ML and integrated launch vehicle are then transported by the crawler transporter to Launch Complex 39B (LC-39B). The vehicle is attached to the ML through a series of umbilical interfaces and a stay arm. With a nod towards the potential switch to liquid boosters, following the outcome of a booster competition in the coming years – as much as SLS will launch at least two missions with the five segment Solid Rocket Boosters (SRBs) – integration inside the VAB will begin with the boosters on the ML, followed by the SLS Core Stage. 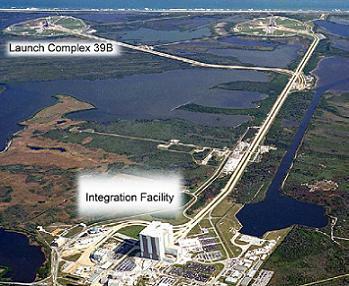 “Integration of the SLS on the ML will take place vertically in the VAB. Liquid stages arrive ready for integration at the VAB. A receiving inspection is performed prior to transfer to the VAB. Solid boosters arrive at the VAB in completed segments from the offline process facilities. Solid rocket booster (SRB) assembly is completed in the VAB and constitutes the first steps of the vehicle assembly process,” added the presentation. “Once both SRBs complete assembly, the liquid stages are attached to the boosters, which provide support for the vehicle on the ML. The last step in the assembly process is to attach the Orion-MPCV, Orion-MPCV with payload, or payload/fairing to the top of the core stage. “For SLS/payload missions, the integration of the payload, CPA, and fairing integrated unit to the SLS core stage is performed in the VAB. This operation essentially involves lifting the integrated unit as one unit and aligning and installing it to the SLS core stage below. The staging of Orion’s integration on to the stack will depend on the mission – as much as SLS’s main focus is on Beyond Earth Orbit (BEO) missions. The Con Ops presentation covers the contingency that Orion and SLS will be required for ISS missions. “For ISS back-up crew delivery missions that do not require an iCPS (Interim Cryogenic Propulsion System), the Orion-MPCV (CM/SM/SA assembly) arrives at the VAB from the Multi-purpose Processing Facility. The LVSA (Launch Vehicle/Stage Adapter) and the launch stack spacer arrive at the VAB from their manufacturing facility. 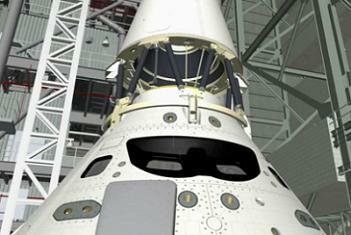 The LAS arrives at the VAB from its manufacturing facility and is integrated with the Orion-MPCV (CM/SM/SA assembly). “The LVSA is mated to the core stage. Next, the launch stack spacer is integrated to the LVSA to bring the height of the Orion-MPCV integration plane to the same level as if there were an iCPS in the stack. Then the MSA (Orion-MPCV/Stage Adapter) is mounted to the launch stack spacer. Next, the Orion-MPCV (CM/SM/SA/LAS assembly) is mated to the MSA. “For BEO lunar missions where the Orion-MPCV is paired with an iCPS, the LVSA is first mated to the core stage in the VAB. Next, the iCPS is mated to the LVSA. The MSA is then mated to the top of the iCPS. The LAS arrives at the VAB from its manufacturing facility and is integrated with the Orion-MPCV (CM/SM/SA assembly). Once SLS stages and Orion-MPCV/payload(s) are integrated, ground interfaces will be established with the ML and a series of integrated tests will be performed to verify all flight systems prior to rollout to the pad. “These tests will verify system interface continuity and vehicle systems interface functionality, and establish the vehicle as ready for launch operations. The SLS will have the capability to execute scripting of command sequences in support of testing activities,” the Con Ops presentation continued. “Integrated launch training simulation and systems verification are performed in conjunction with end-to-end testing, with the support of the suited crew as appropriate for the mission type. Integrated launch training simulations will terminate prior to main engine start commands. “During end-to-end testing, personnel will not be required to enter the non-habitable volume of the vehicle or payload fairing to decrease the risk of personnel injury and hardware damage from energized systems or moving parts. This reduces processing time and limits specialized access platforms. The presentation added that the Electrical Ground Support Equipment (EGSE) used to test the vehicle at the launch site will be developed by the SLS Program and the 21st Century Ground Systems Program (21CGSP). “The EGSE will be developed to be interfaceable with the 21CGSP Ground Operations Control System (GOCS). Remote access, if required, will be via the GOCS. Special test equipment (STE) used for contingency operations within the SLS will be developed by the SLS Program. Following the completion of testing, all the GSE will be removed, allowing for closeout activities/documentation, along with final ordnance connection tasks – allowing for the stack to rollout of the VAB enroute to 39B. “The ML and integrated launch vehicle are then transported by the crawler transporter to LC-39B. The SLS rolls out to the launch pad without purges or power. The Orion-MPCV or payload may require purge capability during rollout and this may be provided by mini portable purge units (MPPUs) on the ML,” added the presentation. A lengthy section of pad flow operations is also covered, which will be outlined in the article covering the ML’s test phase at the pad. 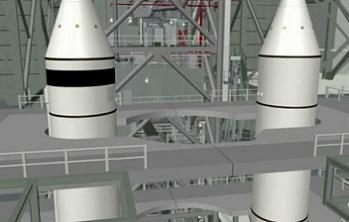 Several articles will also follow on various sections of the impressive SLS Con Ops presentation.